This Bangkok City Hotel, a true upscale hotel internationally managed by ACCOR which located in a vibrant area of Sukhumvit where major business, shopping and leisure are right next to each other. Our hotel features 386 rooms and suites with FREE Wi-Fi throughout the hotel. Within walking distance to Nana BTS sky train station, and offers easy access to other major places of interest. Only 45 minutes the elevated highway will take you from Suvarnabhumi International Airport. 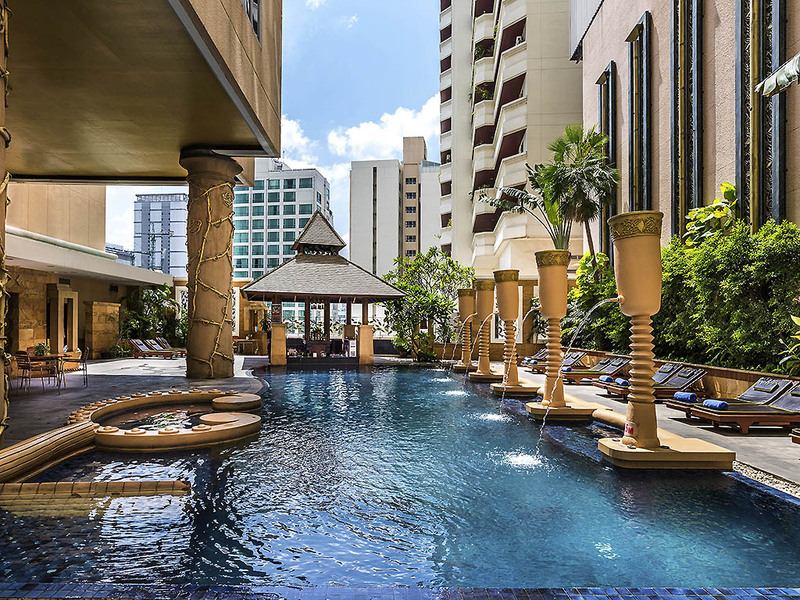 Grand Sukhumvit Hotel Bangkok, located in the heart of Bangkok within the main entertainment and shopping destinations, offers the perfect base to explore the city. Nearby attractions include Bangkok Ocean World, Siam Paragon, Central World, Terminal 21, and The Platinum Fashion Mall. A lot of bars and restaurants are within short walking distance. The hotel is also easily accessible from Nana BTS Skytrain Station. All 386 rooms at Grand Sukhumvit Hotel Bangkok exudes a warm and inviting ambience with every modern amenity to provide the ultimate in comfortable luxury. Rooms and suites are presented in two distinct towers offering breathtaking views over the city. At BonBon we are dedicated to bring you a taste of France! Consistent, flavorful, and filling without being heavy, the perfect place for pastries and light snacks. Experience the art of fine French patisserie at our deli shop BonBon. Located on ground floor, Café de Nimes designed to be one of the hottest attractions of the hotel. Our chefs create mouth watering starters and main coursers, blending Mediterranean and Asian flavors in imaginative, artistically presented dishes. Dedicated sun worshippers can order refreshing drinks and light meals from the relaxed poolside bar, Aziza. Le Mirage, humidor external lounge a cozy retreats with big-screen TV, perfect for catching up with sporting events and the international news. A great range of beverages and light snacks is available at all times. Petrus, the Lobby Bar, is a minimalist-modern yet colorful and cozy space for cocktails, best wines and chats, soothed by hip mood music and a live band in the evening. The hotel is located close to sky train “Na Na station “ about 5 minutes walk. The room is quiet good with little pantry. Great central location, close to bts... concierge and reception staff wonderful. Room clean and tidy but getting tired, could do with make over. Good location , friendly staff , nice coffee illy, needs better equipments for the gym , I wish the swimming pool at the roof for better Sun. The staff were really friendly, they were happy to answer the telephone and answer our questions even though they probably have them questions thousands of times a day. The food was delicious and had lots of choice. There was nothing to criticise except the bar by the pool, it states no food or drink but when me and my girlfriend wanted to buy a drink there was nobody there in the morning so we could not. Checking in and out was quite positive. All staff are very pleasant and willing to help. Although it is located off a very busy side road with a lot of entertainment in the evenings and nights, once in hotel it is a calm and quite pla e to have a peaceful good night sleep. A hotel I always come back to. I have been staying at Grand Sukhumvit over many years now and I always feel welcomed. The staff are lovely,the rooms very clean and comfortable and it's usually good value for money. The rooms are quite large, the breakfast is great, the staff are all very friendly and professional. From chick in to chick out all the way was very smooth and all the members were very cordial and willingness to help. From check-in to check-out, the staff was very helpful. This is an old hotel with old furniture and poor sleep quality. Low breakfast varieties more like four stars hotel, not worth for your money value, the only good thing about this hotel, is its location. I have been patronizing this hotel regularly over the last 10 years and it is still good value for money. The rooms in the Garnet (back) tower are superb. The breakfast buffet offers something for every taste. Unfortunately I have noticed many groups from Mainland China who have no manners and are very noisy and messy. Excellent! However I do not like the new pool furniture. I like the new sun loungers but I really do not like the black leather armchairs. When it is so hot and humid these kind of chairs are not very comfortable to sit in. Not so bad if you are not planning to sleep. Fake Aircon fake thermostat, never ever working! Or you refund it off, or its 21 degrees'i don't speak a out 1 room, I speak about allllll the rooms!! !